I’m not one to initiate a stare but look at those crispy edges. And the clusters of caramelized crunchy goodness. And the specks of orange zest. YASSS. 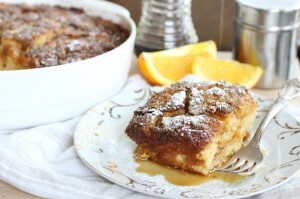 Wait until we slice… there’s an irresistible blend of citrus swirling around with vanilla and honey flavors, all infused into the most decadent custardy french toast under a golden brown exterior. 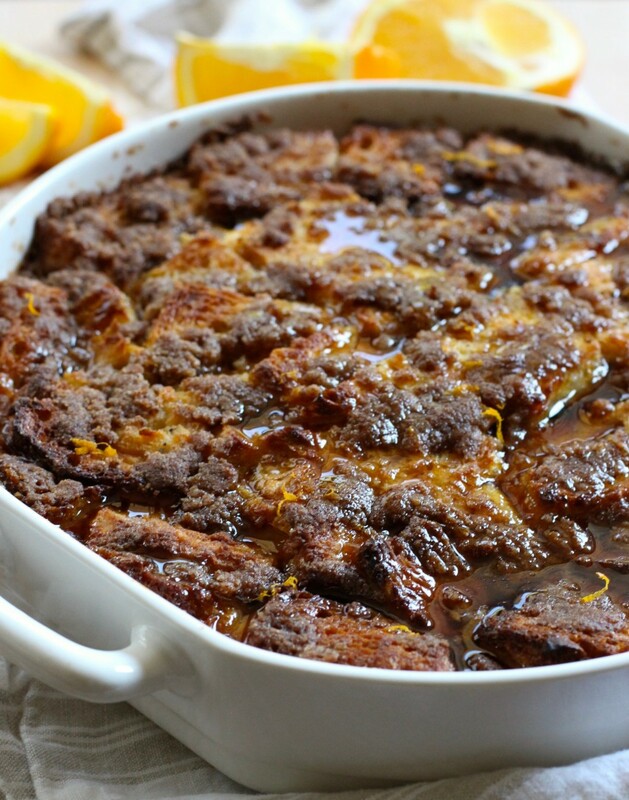 If you happen to be looking for Easter breakfast/brunch ideas, this overnight orange honey vanilla baked french toast is not only delicious but easy to make ahead, and a crowd pleaser. Psst! You can also bake-then-freeze this way before the holiday if you need the oven space for other baking. Thaw in the fridge the day before, bake the morning of …none the wiser. Whether for a holiday or chilling out in PJ’s, the weekend can only get better with this. 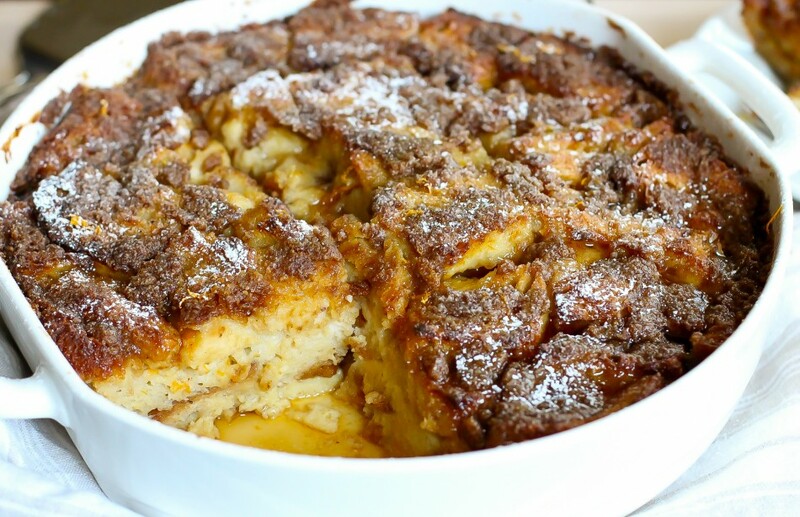 With bread, of course, and lots of cinnamon infused texture. You need to make this soon. 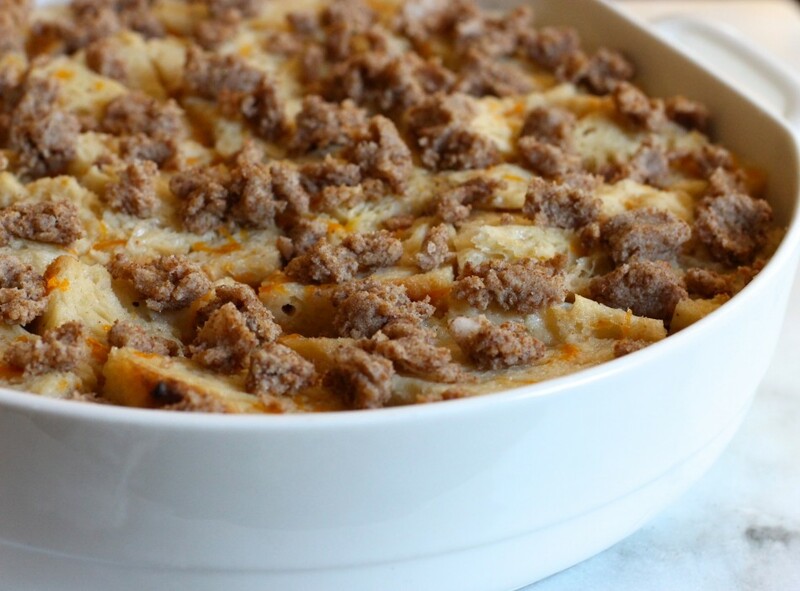 Serve this to your gluten and dairy loving family/friends, I dare you. I’m telling you, rock star status is all you. They (or you) will not miss the gluten and dairy (or soy) one bit. Scouts honor. The serving size may seem too big for two or three, consider Monday morning leftovers – just as moist and intense in flavor – or freeze for another day. If you must, halve the recipe, but don’t say I didn’t warn you. 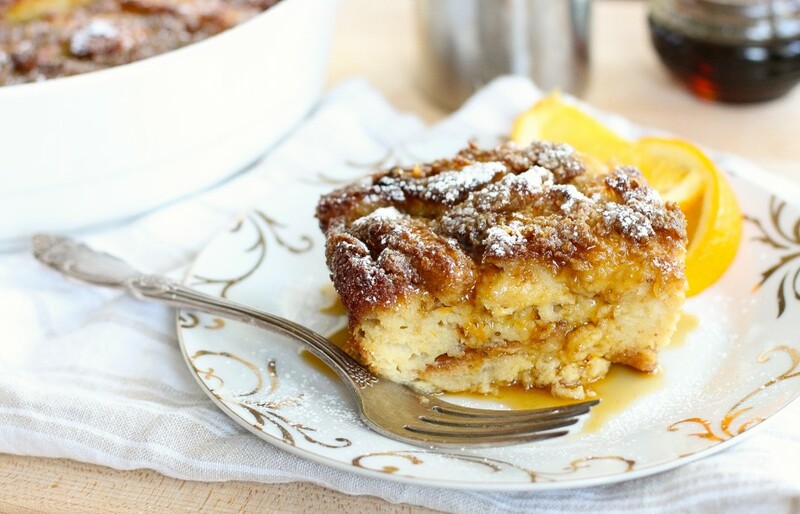 A make-ahead breakfast or brunch crowd-pleaser full of orange vanilla flavor bathed in a rich honey custard french toast baked to heavenly perfection. 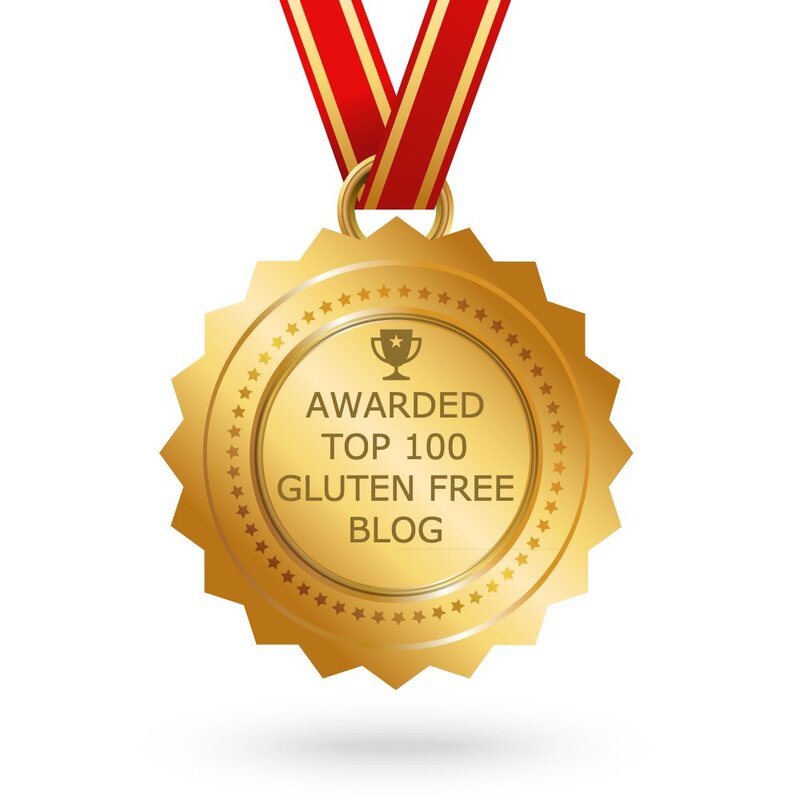 It may have you wondering how on earth it is gluten, dairy, and soy free! 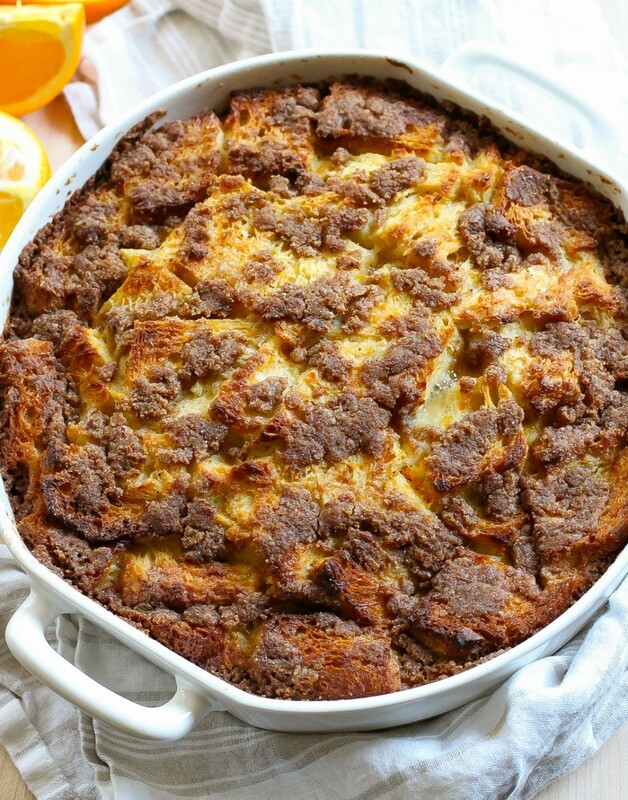 Grease a 9-inch round baking casserole dish at least 2-inches deep or a 9 X 9-inch rectangular pan at least 1½ inches deep. Crack eggs into a medium bowl, whisk to combine then add sugar, oil, honey, orange zest, orange juice, coconut milk, orange extract, vanilla, nutmeg and cinnamon; whisk to combine well. Working in batches, stack up about ½ a loaf and using a serrated knife cut of crust ends bread, then cut into fourths. Don't discard the ends, use for breadcrumbs at another time. Trimming a stack of 4-5 bread slices will speed up the process. When all the bread has been cut, transfer into the greased baking dish. It will form 2-3 layers of bread cubes. Pour the egg-sugar mixture over the bread pieces and press bread down into the wet mixture for about a minute. The liquid egg mixture will only come up halfway, exposing the top layer of bread cubes, with orange zest sticking onto the bread. 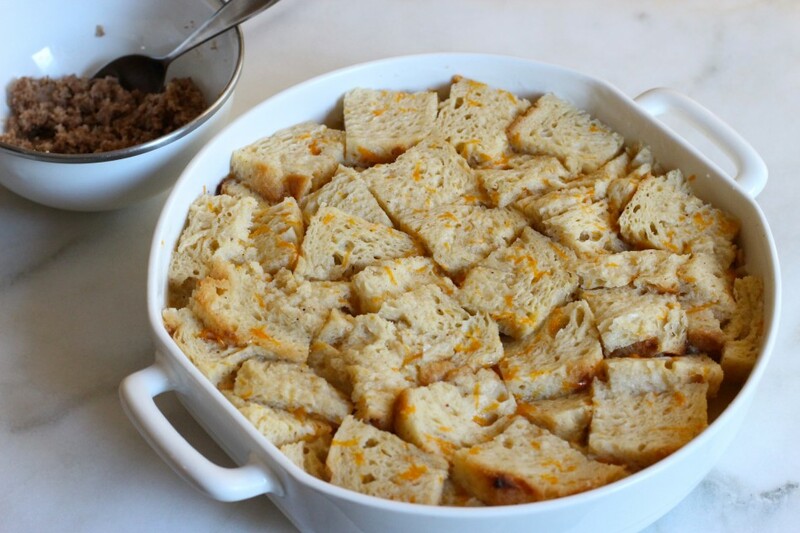 Compress the topping ingredients to form clusters, then distribute across the french toast. Cover, first with parchment paper and then aluminum foil and refrigerate overnight. When ready, bake for 20 minutes. Uncover and continue to bake another 30 minutes. Take a peek after 25 minutes to check for doneness, as oven temperatures and elevation vary.Test for doneness with a skewer or knife, it is ready when it comes out with a wet crumb and the french toast feels somewhat firm to the touch. Optional: add about a teaspoon of orange zest evenly across the french toast. Let it cool for 20 minutes before slicing so the liquids can redistribute. Serve with maple syrup and/or confectioner (powdered) sugar. It has a good amount of sweetness already so you may want to taste first and add to your liking. Note: I find wrapping with both, parchment paper and aluminum, helps trap more steam than the conventional way with just aluminum foil, resulting in a french toast bake that is always moist even when it continues to bake uncovered. This recipe is very adaptable; it can be baked ahead up to 2 days in advance, cooled completely then covered and stored in the refrigerator. Reheat in a preheated 300 degrees F or 148 C for 20-30 minutes until nearly hot. Serve immediately. For make ahead freezer alternative: prepare then bake as noted in the recipe. Cool completely (to avoid freezer burn) then cover with heavy-duty aluminum foil, then seal with plastic wrap three-ply and freeze or use jumbo sized freezer bags to seal the baking dish. Thaw overnight in the refrigerator. Then reheat in a preheated 300 degrees F (148 C) oven for 30-40 minutes or until hot in the center. For a boozy alternative: add a few splashes of Cointreau or Grand Marnier to the egg mixture, both gluten free, dairy free, and soy free. 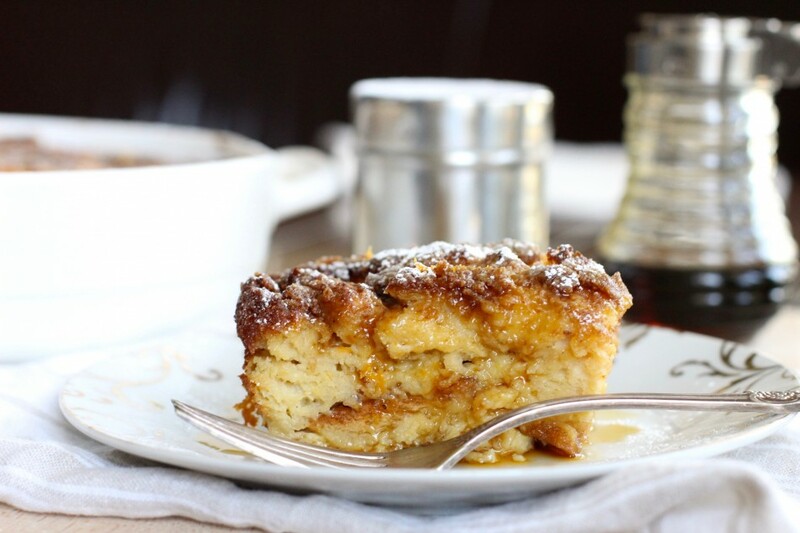 I'm not waiting for Easter, this french toast is on the menu for this Sunday. I can already taste the goodness. Haha, thanks Linda; I have to admit, it's too good to resist! This looks outrageous and wow so moist. I cannot wait to try this. I want it now! Jessica, my family will go nuts for this! Thank you for making recipes like this that we can enjoy even while living without gluten and dairy. We are not missing a thing. :) Have a great day! My pleasure; it definitely will not have you missing a thing and so, so good. Hope you and your family enjoy!! I'm testing recipes for Easter this weekend and this is now on top of my list. I cannot wait to sink my teeth into this!! 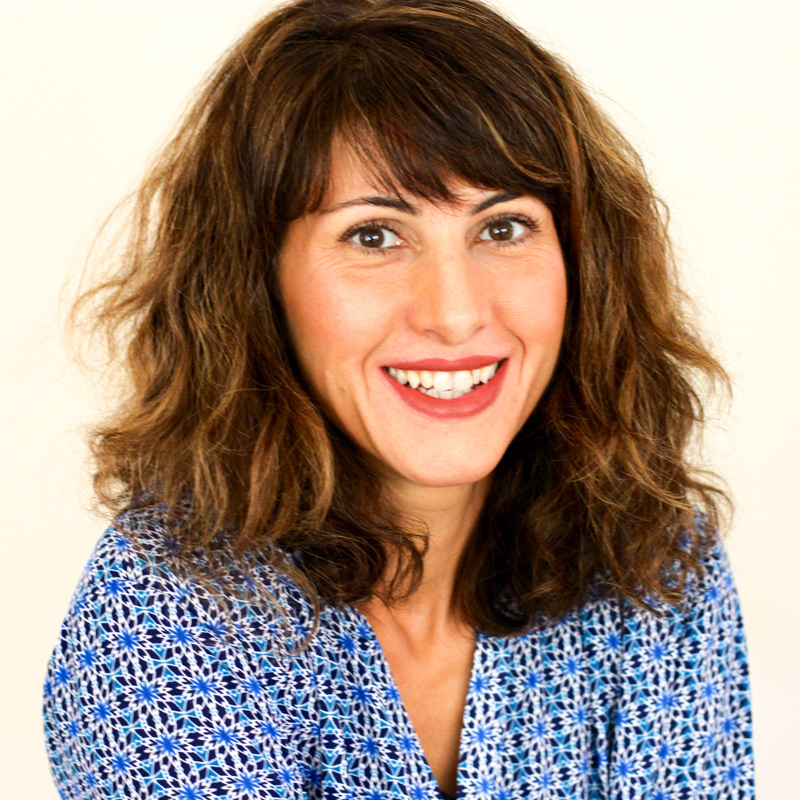 You make eating gluten dairy soy free look so easy and I love it! 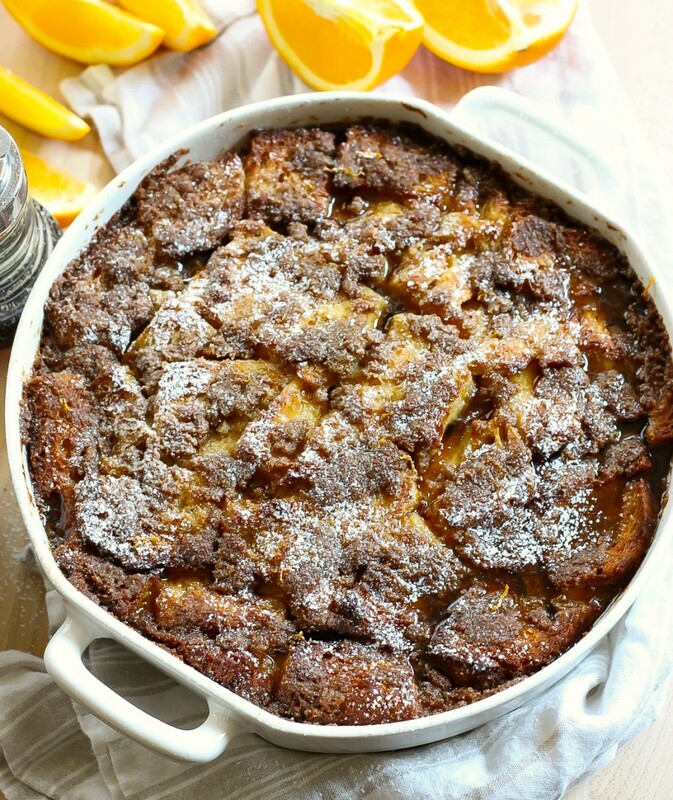 I love your overnight apple raisin french toast and will definitely be making this this weekend. I had a question about the baking time, your apple raisin French toast says to bake 30 minutes covered then uncover 20-25 minutes where this says the opposite. Any reason for that? Thanks Jessica! Holy moly this looks delicious. I like the idea of adding liquer - yummers!! Thanks Stephanie, hope you enjoy!! This looks lovely for Easter. I usually bake with hard boiled colored eggs inserted into some sort of baked breakfast and think this may be a hit. I'm thinking I should put the eggs in before I bake but your recipe states to cover for part of baking, what do you suggest? Thanks in advance Jessica! Ooh, I think it would be just beautiful with colored eggs! If the eggs are already boiled, I suggest removing the parchment and foil in the morning, placing the eggs onto the french toast then cover it up again and bake per the preparation. I wouldn't leave the (dyed) eggs in the unbaked french toast overnight - it will stain the egg mixture unless you are going for that look. Either way, when you continue to bake, uncovered, it will dry out any steam condensation created on the eggs while covered. Enjoy!! 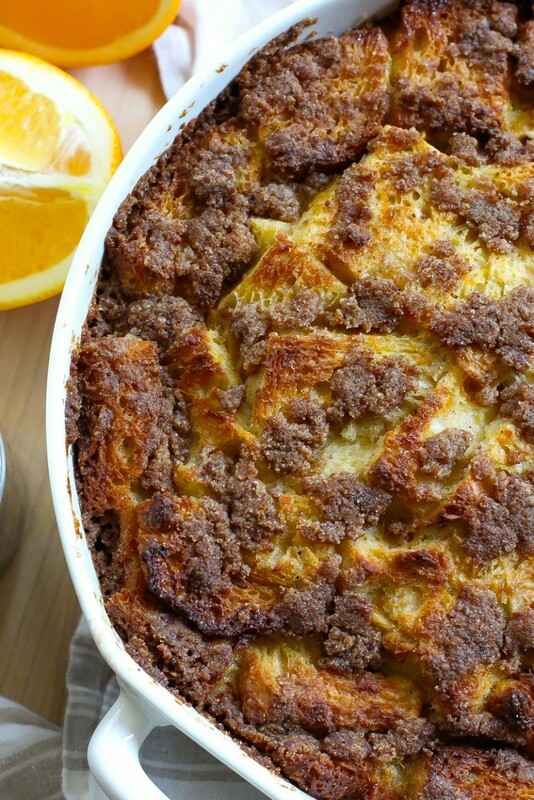 I am obsessed with french toast casseroles and this one looks amazing! Must...have...it! Hehe, me too! Thanks so much Elle!! How lovely a dessert / breakfast! Isnt't this better or more allowed than just eating cake or a danish for breakfast which I always feel guilty about. Not a baked french toast, but after several portions maybe I will! Looks yummy! This french toast looks amazing! I'm OBSESSED with the amazing flavor combo going on here! Thanks so much Bethany! Me too...kinda wish this didn't go so fast! Curious, in looking over the recipe will the orange juice come from the navel oranges or elsewhere? Not only does it look beautiful but tastes even more so! This was just about the best baked French toast I have ever had. You have balanced the flavors beautifully. I would never have believed this was gluten and dairy free if I didn't make it myself! Can I prepare this the night before and then bake it in the morning or will it get too soggy? Yes, you definitely can Colleen as the recipe is intended - to make weekend-style breakfasts easier. Hope you give it a try! I'm a little confused... where's the overnight part to this? This was absolutely delicious! Nobody at my brunch could believe it was gluten and dairy free. My daughter, who helped me make it, was so proud that our family love it! Thanks for the big hit today! I will be making this for Mother's Day brunch! Sounds iPod a and delicous! What can you recommend for a non canned coconut milk? Thanks! I use the coconut milk (not canned) sold in the refrigerated section (So Delicious or Califia brand) but if coconut is an issue or unavailable feel free to use any other non-dairy milk, with the exception of rice milk, which doesn't yield the best results. Nut-based milk like almond, cashew or even hemp milk will give the french toast its richness. Hope that helps and hope you love it as much as we do - Happy Mother's Day!! I made this for my mother's day brunch and it was perfection! Hi, I was excited when this appeared in my search for a dairy free breakfast entree. I'm confused as to why it is tagged dairy free yet uses 8 eggs.